Classic American Southwest look. 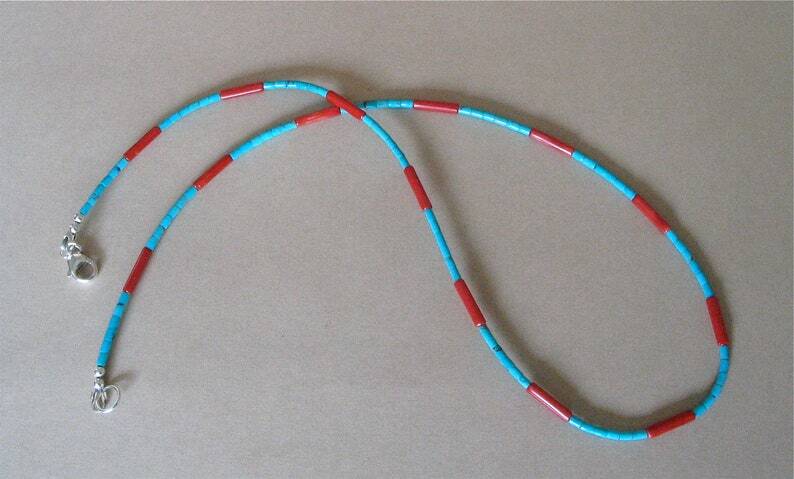 Tiny 2mm Kingman turquoise heishi and 3mm x 12mm red bamboo coral tube beads evenly spaced the length of the necklace. Be sure to look at the last photo where I have placed a dime next to the necklace so you can see how tiny these beads are. Finished off with a sturdy sterling silver lobster claw. Suitable for men and women. Looks great by itself, or stacked with other necklaces. The length of the necklace is 20 3/4 inches.